By Marabet Morales and Sandra Tavel. The crowd reflected what many love and treasure most about Oakland: its diversity. It included folks of all identities, shades and ages. It felt like home in the brightly lit space, punctuated by energy, art and sneakers. “There really wasn’t very much resistance to the measure at all,” said Jahmese Myres, campaign director for EBASE (East Bay Alliance for Sustainable Economy.) 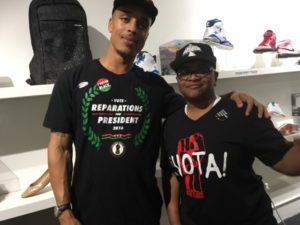 She described the measure as part of a larger movement of economic support for Oakland’s existing communities, saying it is not just about individuals and families, but about the overall Oakland community. For every high -paying tech job, there are two to three related low- wage jobs, she said, asking how the city can support lower-wage workers. 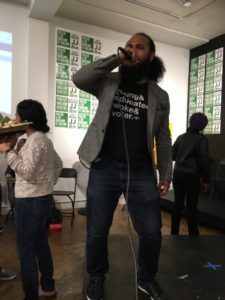 Much of the success of the measure was attributed to tireless work by campaigners with a “text-a-thon” that aimed to reach 18-34-year-old Oakland residents and made 21,000 contacts. Gary Jimenez, the East Bay VP of SEIU Local 1021 echoed Myres, emphasizing Measure JJ is a piece of a larger puzzle to create more housing for existing Oakland residents. During the election party, it was obvious the supporters were confident. The immense community support helped propel Measure JJ to success with ease. Myres said the work is never done, if anything, it will continue to evolve. 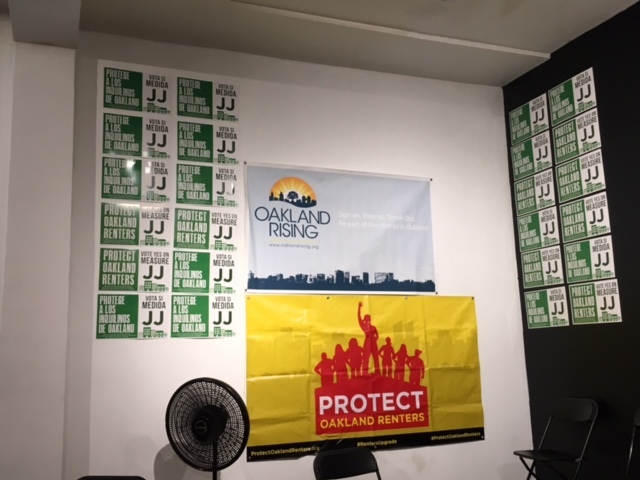 At the election party we observed an increasingly united Oakland; it created a sense of calm and fun during a tense evening. It encouraged the belief that if we come together and work in unity, change is possible. That change for future generations and even for the present Oakland community is real. This election party reminded us that the small wins and combined local efforts add up to bigger wins. Measure JJ is a collective, shared effort with what appeared to be horizontal collaboration with many equal hands on deck. It will be interesting to see how the culture of Oakland will evolve and adjust to this win. We look forward to seeing the diversity expand and settle in from North Oakland to East Oakland. What makes Oakland so unique is the power in our community and our passion to make Oakland welcome to everyone more equitably and by lifting from the ground up.